Need NYC Triathlon parking? Look no further! On July 16, thousands of people from all over the world will come to New York to swim, bike, and run in the Big Apple for the annual New York City Triathlon. Below is everything you need to know about the NYC Triathlon as a spectator and participant. There are plenty of transportation opportunities for spectators and runners to get to the race. To avoid the Race Day stress of finding parking along the countless street closures and traffic that comes with the event, reserve a parking spot in advance with SpotHero. SpotHero offers affordable parking spots near the triathlon, so you will be able to compare spots and rates in advanced. You’ll know where you need to park, so you can concentrate on the race, not the parking. 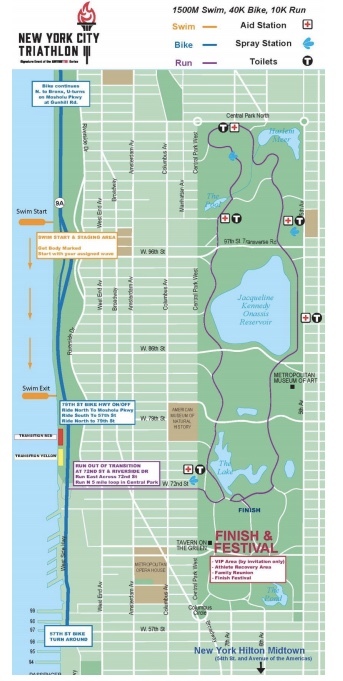 $15 from the New York Hilton Midtown to Transition (79th Street & Riverside Drive) or to get to the swim start, cab to 96th St. & West End Ave. and walk to the start. New York City has plenty of subway lines and buses, so a Metrocard purchase can get you to the triathlon easily. Shuttles will be available to take athletes and spectators from the finish area back to transition in Riverside Park from 10:30 a.m. to 1:30 p.m. Shuttles will run on a constant loop, picking up athletes on Central Park West between 70th and 71st Streets and dropping off on West End and 71st Street. Follow the signs on race day to the shuttle area. All bikes MUST be removed from transition by 2:00 p.m.
Download the Race Day mobile app that allows you to check race schedules, course information, tracking and much more. Search “Athlinks Race Day” in the App store and download. Once downloaded, select “New York City Triathlon” from the event list.